conference in Berlin on 6th/7th March 2019.
innovation ecosystem based on smart specialisation. The partners would like to thank the more than 50 participants for coming together and exchanging about the overarching question and networking for future cooperation! You can find all presentations, a short documentation and impressions here. The outputs of the project, among which the recommendations for strategy owners and strategy implementers, can be found in the download section. The conference will start in the morning of the 6th March and end around lunch of the 7th March 2019. Conference venue is the Technologiepark Adlershof Berlin. For more information on registration, programme and hotel recommendations, please click here. On the 28th-29th August 2018, Tartu Science Park and Tartu Biotechnology Park organises two EmpInno R&D transfer workshops for biotechnology companies in Tartu, Estonia. The general topic of the two successive and interrelated workshops is to create a business from science ideas. Participants will learn about new insights on clinical diagnostic and prognostic, current scientific trends and projects and get an overview of key players, funding opportunities and program platforms for supporting instruments within the Biotechnology business. A one-on-one consulting with experts on the second workshop day will complete this SME empowerment event. For more information please follow this link. Registration can be done here. The Week of Health and Innovation (WHINN) 2018 will take place in Odense, Southern Denmark, from 9th-11th of October 2018. WHINN is a week packed with conferences, side events, exhibition, matchmaking and networking activities all related to "Health and Social Innovation", which is one of the three priorities of the regional smart specialisation strategy of EmpInno partner Southern Denmark. The WHINN themes this year are meHealth, Integrated Care and Thought Leadership. For more information please click here. From 8th to 10th November 2017 the Offshore B2B Innovation, Network and New Tech event takes place in Esbjerg, Southern Denmark. The big matchmaking event for developers, technicians, salespeople and purchasers brings together the entire offshore energy in the priority "Sustainable Energy" as one of Southern Denmarks three smart specialisations. For the first time also a hackathon is conducted that solves the challenges defined by the industry itself. More information and a link for registration you can find here. The Week of Health and Innovation (WHINN) will take place in Odense, Southern Denmark, from 9th-12th October 2017. 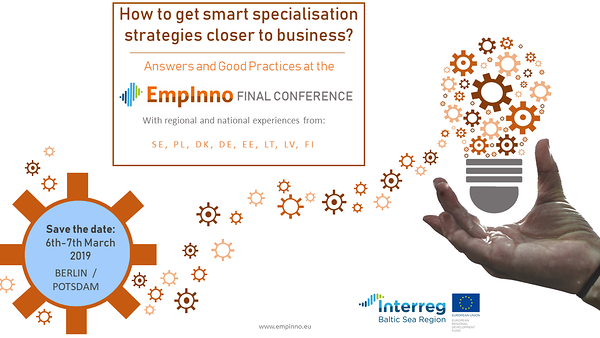 WHINN is a week packed with conferences, side events, exhibition, matchmaking and networking activities all related to "Health and Social Innovation", which is one of the three priorities of the regional smart specialisation strategy of EmpInno´s partner region Southern Denmark. The main topics for this year´s WHINN are connected health, valuebased health and care as well as sustainable hospitals. You can find here more information and a possibility to register. In order to exploit synergies among the partner regions whose smart specialisation is related with food, the Regional Council of South Ostrobothnia organises an EmpInno transnational delegation trip with matchmaking event to the Farmari agricultural exhibition in Seinäjoki, Finland. Farmari is Finland's agriculture exhibition that takes place in the city of Seinäjoki, from 14th to 15th June 2017. It brings together professionals from the field of agriculture, forestry, water and natural services as well as the food and energy sector from Riga Planning Region (Latvia), Lublin and Kujawsko-Pomorskie Voivodship (Poland). For more information about the event and participation in this trip, please contact Sanna Inkeri (sanna.inkeri@etela-pohjanmaa.fi). In order to realise synergy potential among the partner regions whose smart specialisation is related with ICT, the Kiel Business Development Agency will organise a delegation trip with matchmaking event to the CeBIT 2017. CeBIT is the world's leading trade fair for ICT-industry and takes place in Hannover, Germany, from March 21-24, 2017. This event will bring together business development organizations, city governments, science and technology parks and ICT companies from South-Denmark, Tartu (Estonia), Kiel (Germany), Riga Planning Region (Latvia), Kaunas (Lithuania) and Region Gävleborg (Sweden). For more information about the event and participation in this trip, please contact Dr. Andreas Borchardt (aborchardt[a]kiwi-kiel.de).